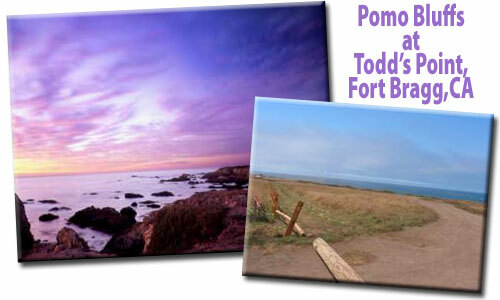 Pomo Bluffs Park on Todd's Point in Fort Bragg, is a relatively new city park (opened April 22, 2006) on the ocean bluffs overlooking the Noyo Harbor entrance and, of course, the Pacific Ocean. There is a paved walkway here suitable for wheelchairs or strollers. And there are benches along the way if you want to sit down. The trail is probably less than a mile, but you can walk as short of a distance as you like and turn around. Interpretive signs along the way cover history, flowers, and animals. Background: The park consists of 25 acres of spectacular bluff-top property on the south headlands above Noyo Bay in Fort Bragg. Acquisition and construction of the park were financed with grants from the State Coastal Conservancy and CalTrans, with input from park neighbors, the broader citizenry of Fort Bragg, local and state agencies, and City officials. As a City park, the public's opportunity to view this striking piece of coastline and to walk along its bluffs and promontories will be preserved and protected in perpetuity. Access: South of the Noyo Harbor bridge at the stoplight next to the Emerald Dolphin Inn is the street leading to the park. A sign points the way.